Atlanta Commercial Trucks has the durable and dependable work van that’s great for commercial duties with the 2015 Ram ProMaster. If you are seeking best-in-class max payload then look no further than the Ram ProMaster from Atlanta Commercial Trucks. 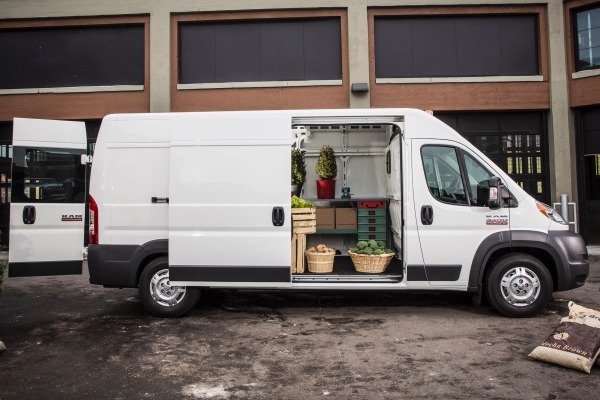 The ProMaster is ready for work with four available and different trim styles — cargo van, chassis cab, cutaway and window van. The cargo van boasts a best-in-class 36-ft. turning diameter while the chassis cab, cutaway and window van have a class-exclusive front-wheel drive system. All ProMaster models have best-in-class standard V6 power. The exterior of the ProMaster is anchored by its doors. The rear doors open 260 degrees, folding nearly flat against the van so the rear doors don’t get in the way during heavy lifting. The rear doors also provide a 60-inch doorway while the sliding side doors open to 49 inches. This allows all three access points to fit standard pallets making forklift loading simpler. Raised headlamps and taillamps move vehicle lights away from common impact zones, while the fascia are constructed of durable, thermoplastic composite panels and are easily removable for simple serviceability and lower repair costs. The interior is highlighted by the sidewalls constructed at almost a 90-degree angle, making it easier to stack, carry and load boxes which maximizes and stabilizes cargo space. The available Uconnect System features a 5-inch Uconnect Touchscreen, Uconnect Voice Command and Bluetooth hands-free calling as well as available navigation capability. Also available is the integrated rearview ParkView Rear Back Up Camera. With the class-exclusive front-wheel drive system, there’s no driveshaft beneath the body, allowing room for a best-in-class lowest load floor height of 21 inches. 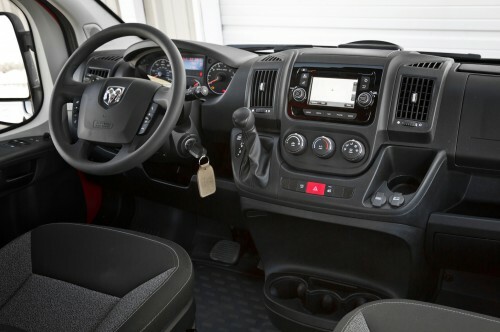 The Ram ProMaster is powered by a best-in-class standard 3.6-liter Pentastar V6 engine when paired with the standard 62TE six-speed automatic transmission. As one of Ward’s 10 best engines three years running, the gas engine has 280 HP, 260 lb.-ft. of torque and towing of up to 5,100 pounds. An advanced and durable diesel 3.0-L inline four-cylinder engine is also available and comes standard with an M40 six-speed automated manual transmission. With this set-up, torque is increased to up to 295 lb.-ft.